Young Emlen artist points to his work with teacher Denise Veronick proudly looking on. The Mt. 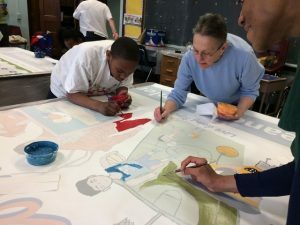 Airy Art Garage (MAAG) has spent the last school year as artists in residence at Henry Houston and Eleanor C. Emlen public schools asking participating children in the Community of Pride (COP) Mural Project “What Makes You Proud?” Our goal has been to deepen a sense of community spirit and pride, using art as a means of communication among the children. 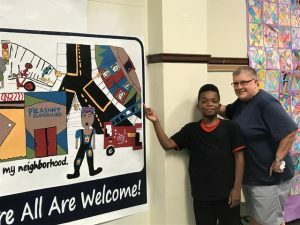 It is with great pride and pleasure that we invite you to join us as we dedicate these murals, and celebrate the personally expressive imagery, all created by the children, that have been incorporated into the large scale on site murals. We plan to celebrate with the entire Emlen school at an auditorium celebration. Plus you’ll then get be part of the actual mural dedication including framed drawings by participating student artists. Individual drawings from both schools will then move on to City Hall for a summer exhibition. 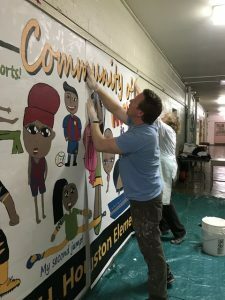 There will also be a smaller scale mural dedication at Houston School, Wed., May 31 @ 11 am, 7300 Rural Lane, Phila., PA 19119. Please check at the entrance for the meeting room. Thanks to Jon Laidacker and Mural Arts for your support in helping us get these murals hung! We have built a culture of goodwill that cuts across political or cultural differences and even embraces them. This project is about enriching children’s lives, offering inclusive opportunities and sharing the positive rewards of making art together. We sincerely hope you can join us a we honor these amazing kids. Admission for the exhibition and opening is free. We thank everyone who has donated and supported us for Phase 1 of the COP Project. We especially appreciate all the ongoing support we have received from East Mt. Airy Neighbors Community Fund (Philadelphia Foundation) — we couldn’t have done it without you! Stay tuned for Phase 2 as we introduce the Community of Pride Art & Literacy Project. Call for MAAG Member Artists! Jazz On The Sidewalk Juneteenth Sidewalk Sale... Fabric Collage Workshop — Your Time to Shine!